Turn your tapes into digital files and listen on your computer, iPod, iPad in the car, or in the palm of your hand! Tape Express Plus™ is a portable, handheld USB tape player that works with all kinds of tapes. It has an easy-to-use USB connection for sending the music on your tapes right into your computer where it's instantly turned into a digital file. You can listen to digital music files on your computer, load them onto your portable music player, or record them onto a CD and listen in your car. Rediscover those old songs with Tape Express Plus! Tape Express Plus is designed with your on-the-go life in mind. Its portable design fits in virtually any bag and enables you to play and transfer music anywhere. It runs on battery or USB power when connected to your computer for easy operation wherever you go. 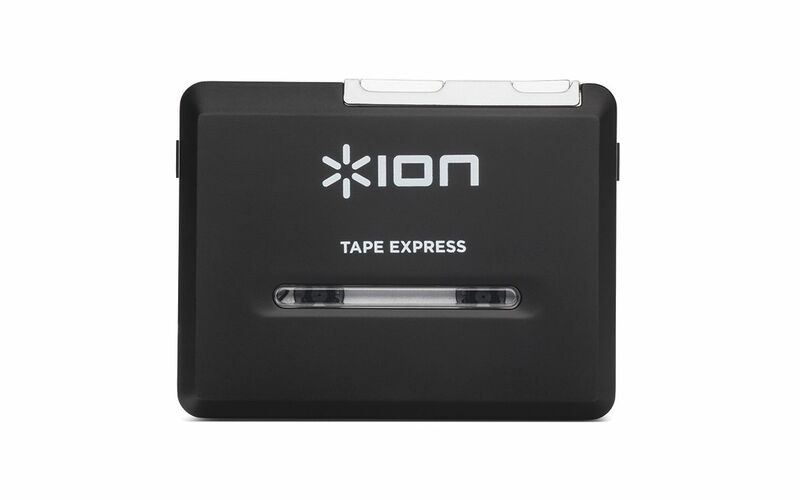 Tape Express Plus comes with ION's exclusive EZ Vinyl/Tape Converter software. This powerful yet easy-to-use program guides you through transferring your music via iTunes. In addition to converting your tapes, Tape Express Plus has an audio output that enables you to listen on the included headphones, or connected to your stereo or other speaker system for hours of enjoyment. It plays both chrome normal cassette tapes. Reconnect with the music on your old cassettes anywhere you go with Tape Express Plus. iPod and iPad are trademarks of Apple Inc., registered in the U.S. and other countries.